I'll be sure to follow your training and see how you like the plan. Yay, to training! I love that shot of you with all the pink! I did a few 'thoughts' posts last year when I was training for Boston and my readers seemed to like them. Lately my thoughts are pretty boring I think, lol. 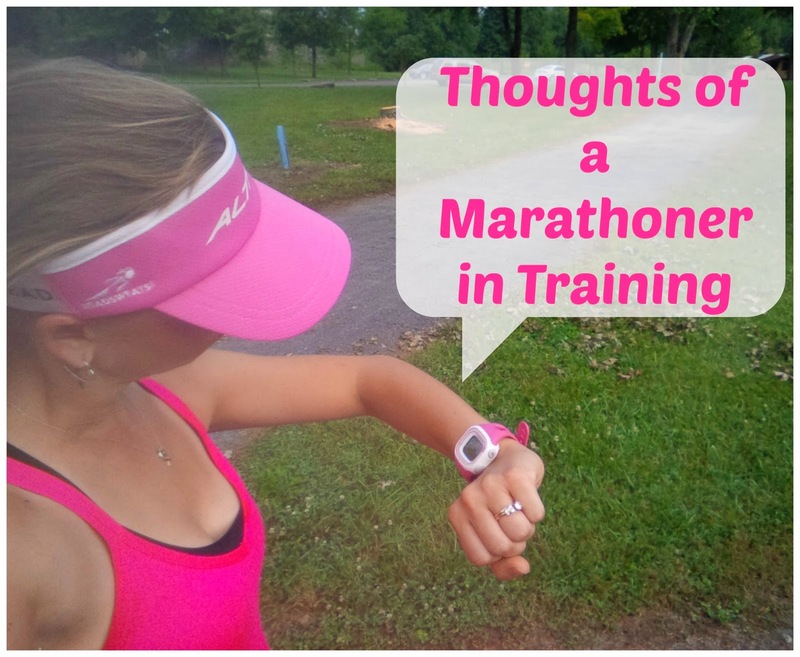 I usually am thinking about paces, racing and food when I run. Sometimes I think of coyotes if I'm in the trail. Yikes! The thought of coyotes would scare me for sure! I am so with you!!!! So many random thoughts on those long runs!!! And the longer the run, the more random thoughts you have...haha! I did Vegas RnR last year so much fun! I'm getting excited for that one. lol... I love the random thoughts. I did half of my Sunday run alone and without music (so about 30 minutes) and surprisingly did not feel bored. But for the life of me I can't remember what I was thinking about at all! I actually went right home and typed all these things down before I forgot! Ever since I started doing long runs with my group, I have very few random thoughts during them. We are so busy chatting about everything that I don't have time to let my mind wander! shorter strides and lifting your knees higher is the hill advice I received! Yea, I guess I should be more focused on my run, but I'm not! I love your random thoughts and am happy your training is going well! I actually don't think too much when I run, I just sing to my music (mostly in my head bc no one want to hear me belt it out!) My only thoughts are usually, just get to the next mile. I wear my headphones but half the time I even forget I have music on! I always worry about finding bathrooms, avoiding potential kidnappers, and usually something totally random in regards to something I see. What intervals do you use? There is a bathroom right in the center of our park so I don't worry about that but for some reason I do worry about some of the creepy people I see. I generally use 3:1 intervals but I mix it up sometimes. That works well for me for now since I am just coming back from my injury. I don't want to push too hard. Woohoo, way to get that run in before 7 AM! I loved this post, it was so fun to read your thoughts during a run. I am surprised that you saw a girl running with her hair down, that would drive me up the wall lol! Glad to see you rebounded after getting sick. My thoughts on Friday were in the "man I'm out of shape" range. Because I am. Thanks Lesley. Whatever I had came on so suddenly but by Friday evening I was starting to feel better. I love posts like this!!!!!!! :) Awesome job! Thank you! Which marathon training plan are you following? Yes, her hair was much thicker and longer than mine too. I don't know how she did it! Bobby pins help is you're afraid of losing your visor. I use them in the wind. I'm glad you feel better and got in a run! I hate when run intervals fall on the hardest part of a outing. I love this random thoughts post! Another gal I follow set a challenge to do this (a while back) and it was just when I got back into being able to run a mile at a time. I tried so hard to remember what I was thinking so I could get home to write it down. My mind kept going off into dream land, by the time I got home I literally only remembered 4 things, LOL. So I am super impressed with your random thoughts, I'm going to guess you are great at focusing! These posts always make me laugh because I am totally the queen of random thoughts. I also love how I am thinking the same type of things and immediately change my mind about things a gazillion times! :) I keep forgetting you're doing ToT- we definitely need to catch up at some point while we're both down there! Loved this! Nice picture of your run with words. Hahaha, yep, that sounds about right to me! I don't run with music, so my mind is all over the place when I run. I've been thinking about possible changing to the full marathon in Vegas. I'm going to wait and see how I feel after Wineglass, before deciding though. ;) We runners are totally crazy. Thanks so much for fixing the Comments problem so I can post! I'm impressed that you got out the door so early! Yay for seeing dogs on runs! I always get a boost when I see a corgi haha! I'm finding that I do my best thinking while I'm out running. Its amazing how many random thoughts us runners have while we're out running!